The c1 is a full feature performance reformer, that uses many of the same quality components as its bigger brother, the a2r. 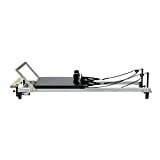 FEATURES – Standard sized reformer, with a generous 100.5cm of carriage travel and comfortable 58cm (w) x 85.5cm (l) carriage. – Resistance: 5 nickel plated quality music wire springs 3 different strengths (2 light, 2 medium and 1 strong) – Foot bar positions : 4 positions including flat – Removable rope risers with 7 height positions and 7 rope length adjustments – Height adjustable feet for perfect alignment – New Align-Pilates ‘silent’ Pilates double loop handles with metal free connectors for a quiet experience – 3 position head rest – Anodized aluminium runners with matched 4 wheel system for smooth and maintenance free operation – Light commercial warranty – perfect for studio and home use – Space saving – the c1 is wheeled & easy to move and store, it can be stood up against a wall (& anchored using the foot strap) or, is stackable in head to toe format. weight 49kg – Highly adjustable with: 4 spring bar, 4 footbar and 4 rope height positions – A nodized aluminium runners with matched 4 wheel system for smooth & maintenance free operation.